Convenient single pack containing Healthy Skin Formula (above) and Hyaluronic Acid. Clear Skin Formula is a unique nutraceutical that combats both inflamed acne and dry skin. Featuring Vitamin A, Zinc and Selenium, this formula addresses skin health internally, to promote a clear complexion. The addition of hyaluronic acid – a natural compound with water binding properties in the skin – differentiates this nutraceutical from Healthy Skin Formula. Zinc– an essential mineral and anti-inflammatory. It is responsible for releasing Vitamin A from the liver and also assists in metabolizing Omega-3’s. In addition, zinc for acne helps to clear away Substance P, a nerve chemical that promotes sebum production. 40-50 mg daily are recommended for treating inflammatory acne. Clear Skin Formula provides a natural alternative to acne medications which can have potent activity but may have significant side-effects. Convenient daily packets are ideal for younger, active, busy lifestyles. Notched packets open easily. Directions: As a dietary supplement, take one packet of Clear Skin Formula daily with food. Each individual is unique and nutritional requirements may vary. Notice: KEEP OUT OF REACH OF CHILDREN. If you are diabetic, pregnant or breast-feeding, seek advice of your physician before using this product. Store in a cool, dry place. Does not need to be refrigerated. 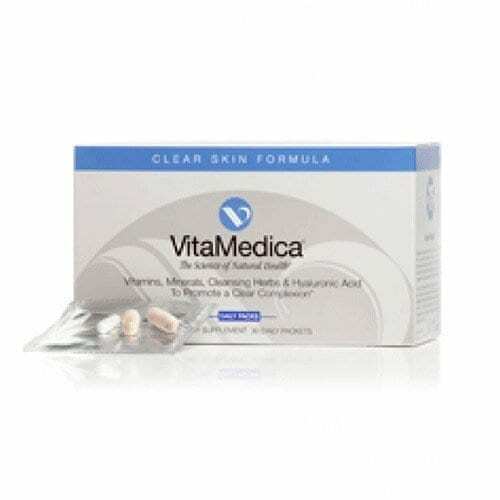 CONTRAINDICATIONS: CLEAR SKIN FORMULA contains vitamin A. If you are presently taking Accutane® (isotretinoin) for the treatment of acne, please refrain from taking CLEAR SKIN FORMULA until the end of the treatment cycle.